Numerous studies have looked at the relationship between family structure and child well-being. Overall, the evidence suggests that children who grow up in a household with two married biological parents, on average, do better than those growing up with a single mother (Bernardi and Boertien 2017; Sigle-Rushton and McLanahan 2014; McLanahan et al. 2013). 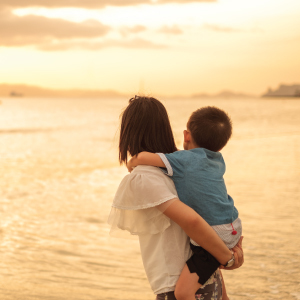 However, existing studies have not considered whether the diverse family trajectories experienced by children born to single mothers may result in different levels of well-being. d) children whose mothers form a stable union with a stepfather (1.5%). The remaining 3.2% of children born to lone mothers did not enter the analytical sample due to either unclassifiable trajectories, missing variables or attrition. Note that we did not consider the timing of the transition, which may have happened at any time during the 7 years after the child’s birth, and we grouped cohabitation and marriage together. Using this taxonomy, we analysed the influence on child well-being of the biological father or a stepfather joining the household, and that of separations, if any. We considered three domains of child well-being: health, cognitive development and socio-emotional well-being. Changes in family structure may affect these domains in various ways. For instance, when a partner for the lone mother joins the family he may bring more resources and become involved with the care of the child, which could be associated with higher well-being in all domains, even if the involvement of stepfathers may be lower than that of biological fathers (Ginther and Pollak 2004). Moreover, if the union subsequently splits up (again), this may create additional stress for the children, with possible negative consequences on their well-being (Cavanagh and Huston 2006). Who are the children born to lone mothers? Mothers who were not living with the child’s biological father at the time of birth belonged to a particularly disadvantaged subpopulation group. For example, equivalised household income is much lower in the case of single mothers than in the case of married couples (about a third); over 50% of single mothers lived in social housing, compared with about 10% of married couples and less than 15% of single mothers had a university degree, compared with over 40% of married women. However, the results revealed important heterogeneity: mothers who were continuously single for seven years after the birth of the child were the most financially disadvantaged, those who moved back with the biological father were the least disadvantaged and the other groups fell in between. Figure 1 shows for each outcome the regression coefficients of the various family trajectories in relative terms, the standard of reference being that of children who lived stably with a single mother from birth. Children whose biological father joined the household after their birth had better cognitive skills and were less likely to develop depressive symptoms than children who only lived with their single mothers. Conversely, the arrival of a stepfather in the family was not associated with improvement on any of the outcomes (and was instead associated with a marked worsening of cognitive verbal skills). This finding suggests that the benefits of improved resources and parenting input may be cancelled out by the difficulties in adjusting to a new situation in the child’s home environment when a stepfather joins the family. Finally, if the biological father who moved in after the birth of the child later moved out of the household, we also find no improvement in the cognitive and socio-emotional well-being of children compared to children who only lived with their single mother. 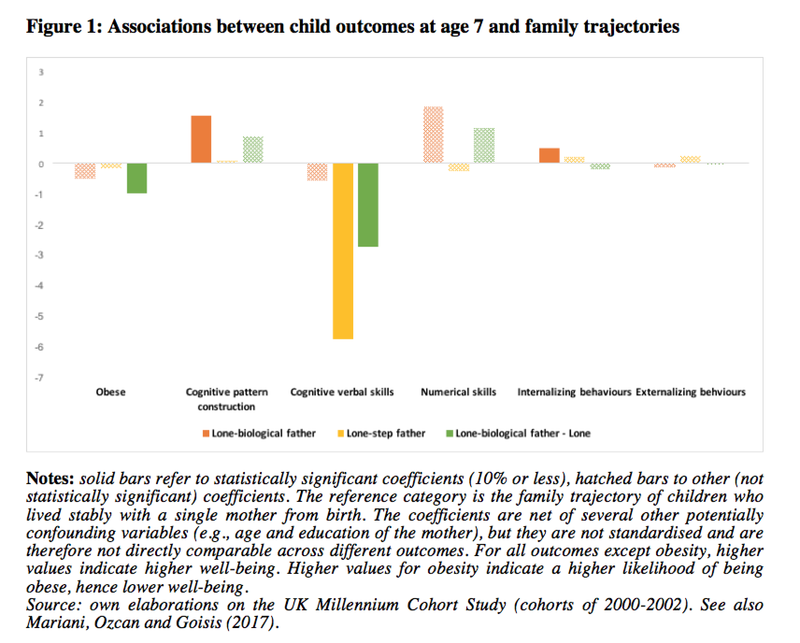 These results highlight the importance of stability of the home environment: the benefits of a father’s entry for children’s outcomes in different areas are clearest if the father is biological and the union is stable (i.e., persists at least until the 7th birthday). This study underscores the diversity of family experiences from birth to age seven of children born to lone mothers. Children living with a lone mother are a subpopulation targeted by social policies in virtually all Western countries. Our results show the merit in distinguishing between different groups of children born to lone mothers, according to the family trajectories they experience in early childhood, which might be associated with different types of disadvantages and need for interventions. Cavanagh S.E., Huston A.C. (2006). Family instability and children’s early problem behavior. Social Forces, 85(1), 551–581. Hansen K. (2012). Millennium cohort study—First, second, third and fourth surveys—A guide to the datasets. Technical report, Centre for Longitudinal Studies. Ginther D.K., Pollak R.A. (2004). Family structure and children’s educational outcomes: Blended families, stylized facts, and descriptive regressions. Demography, 41(4), 671–696. Mariani E., Özcan B., Goisis A. (2017). 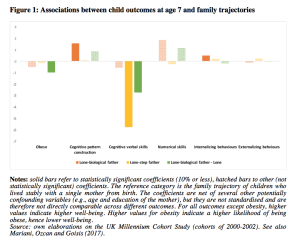 Family trajectories and well-being of children born to lone mothers in the UK. European Journal of Population, 33(2), 185-215. McLanahan S., Tach L., Schneider D. (2013). The causal effects of father absence. Annual Review of Sociology, 399, 399–427. Sigle-Rushton W., McLanahan S. (2004). Father absence and child wellbeing: A critical review. In D. Moynihan, L. Rainwater, T. Smeeding (Eds. ), The future of the family (pp. 116–155). New York: Russell Sage.